MapMill is the Public Lab tool for sorting imagery produced with balloon mapping. 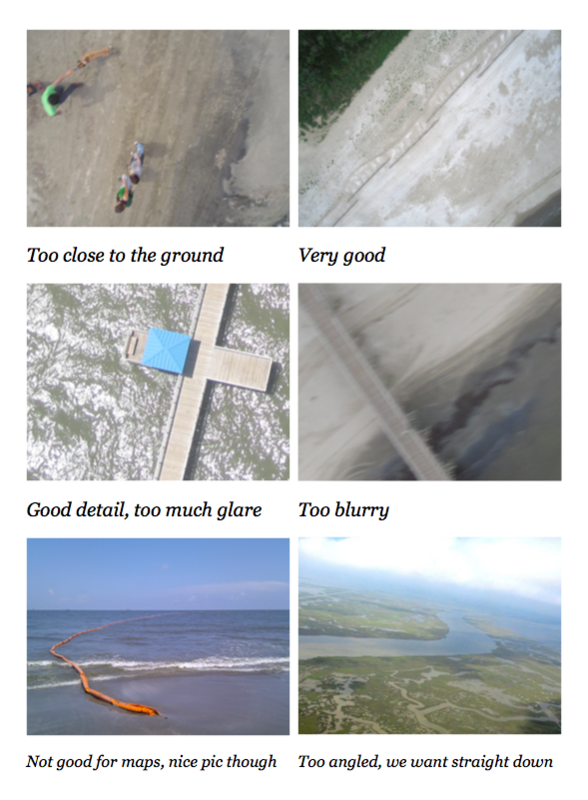 It takes hours to go through the thousands of images we're capturing from balloons and kites, to pick out the best ones for inclusion in our free and open source maps of the Gulf Coast and beyond. Help us with these projects by choosing the sharpest, clearest, best images. If you are creating your own maps, MapMill is a great way to share lots of photos, and to offer a more accessible and inclusive first step in the process of turning images into maps. Email the link to your MapMill site to your community, post it on your blog or on Facebook. It's a great lightweight way to keep people engaged after the flight is over, to reach out to a wider group of folks with new opportunities to participate, and to raise public awareness around the subject of your map. For other approaches to photo sharing, see Photo Sharing. Please add information below to help build out this document! Each image can be voted on only once by each user; this is tracked by a unique cookie issued to each browser. This can be circumvented by using a new browser or clearing cookies -- the purpose is to show each user which images they've already voted on. With the new MapMill 2.0 platform, we've made it possible for the Public Lab non-profit to affordably provide hosting for thousands of images, but this comes with certain constraints. Attempting to upload a large number of images (>100) at the same time may cause slowness on your computer. If you have a lot of images, it may help to use a more powerful computer, or to upload in batches. Why does this happen? To optimize hosting, image thumbnail generation is performed in your browser, rather than on the server. This means that if you drag a thousand images into the upload form at once, your computer must generate all those thumbnails, which could overload your machine. (This is preferable to overloading the server!) A means of generating thumbnails in batches has been suggested here, but has not yet been implemented. If you find a bug or experience problems, or if you are interested in helping to improve MapMill (an open source program), please file an issue on Github. If you are unable to use Github, you may contact web@publiclab.org for assistance. Thanks! If you are creating your own maps, MapMill is a great way to offer a more accessible and inclusive first step in the process of turning images into maps. Email the link to your MapMill site to your community, post it on your blog or on Facebook. It's a great lightweight way to keep people engaged after the flight is over, to reach out to a wider group of folks with new opportunities to participate, and to raise public awareness around the subject of your map. These instructions may be out of date. Please ask on the "plots-dev" developers mailing list for more recent instructions. If you have low bandwidth or don't want to share your map data, you can run MapMill yourself, on your computer. Follow these steps and email plots-dev@googlegroups.com (or join the developers mailing list) with questions or for troubleshooting. Go to the main Bitnami folder which was just installed, called "rubystack-2.2-2"
Download MapMill into the "projects" folder inside "rubystack-2.2-2". if it runs with no errors, type "script/server"
We'll try to get Passenger installed or something soon so it can be multi-threaded, in the meantime it may only be able to handle one pageload at a time. To connect other computers, find out your IP address (linux/mac: type "ifconfig" and it's the one that looks like 192.x.x.x or something) and any computer on the same local network should be able to use it by going to 192.0.0.1:3000 (or whatever your IP address was plus ":3000". MapMill is the PLOTS tool for sorting imagery produced with balloon mapping. If you have low bandwidth or don't want to share your map data, you can run MapMill yourself, on your computer. Follow these steps and email jeff@publiclaboratory.org with questions or for troubleshooting. Download MapMill and unzip it in the "projects" folder inside "rubystack-2.2-2". Copy a folder of JPG images into "/rubystack-2.2-2/projects/mapmill/public/sites/your-folder-here"
Your site should appear in the list. Click "Import images"
After what may be a while (it has to actually scan each image and insert it into the database) the Admin page should reload showing how many images you've imported. Go to "http://localhost:3000/" or click on your site to see your images. It takes hours to go through the thousands of images we're capturing from balloons and kites, to pick out the best ones for inclusion in our free and open source of the Gulf Coast and beyond. Help us with these projects by choosing the sharpest, clearest, best images. It takes hours to go through the thousands of images we're capturing from balloons and kites, to pick out the best ones for inclusion in our free and open source maps. Help us by choosing the sharpest, clearest, best images. If you are creating your own maps, MapMill is a great way to offer a more accessible and inclusive first step in the process of turning images into maps. Email the link to your MapMill site to your community, post it on your blog or on Facebook. It's a great lightweight way to get people more engaged after the flight is over. MapMill is our tool for sorting imagery produced with balloon mapping. Download this version of MapMill and unzip it in the "projects" folder inside "rubystack-2.2-2".